Written by Mike Carey; Art by Peter Gross and Ryan Kelly; Cover by Christopher Moeller A new collection featuring LUCIFER #42-44 and #46-49! The Morningstar faces a new challenge to his universe, as defending the status quo requires cooperation between angel and devil alike. 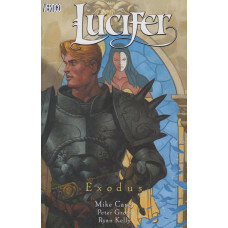 Lucifer decrees that all immortals must leave immediately...or learn about mortality the hard way.